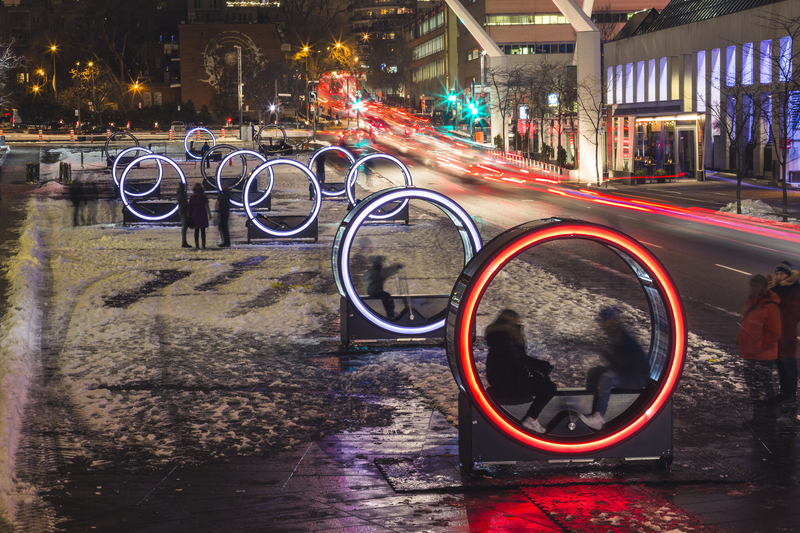 This winter, the Quartier des Spectacles Partnership invites Montrealers and visitors to discover Loop, an original installation on the Place des Festivals, on the Quartier des Spectacles. The work, which will be presented from December 8 to January 29, consists of 13 giant zoetropes – an optical toy that was a forerunner of animated film. When a zoetrope is activated, images are shown in rapid succession, creating the illusion of motion. 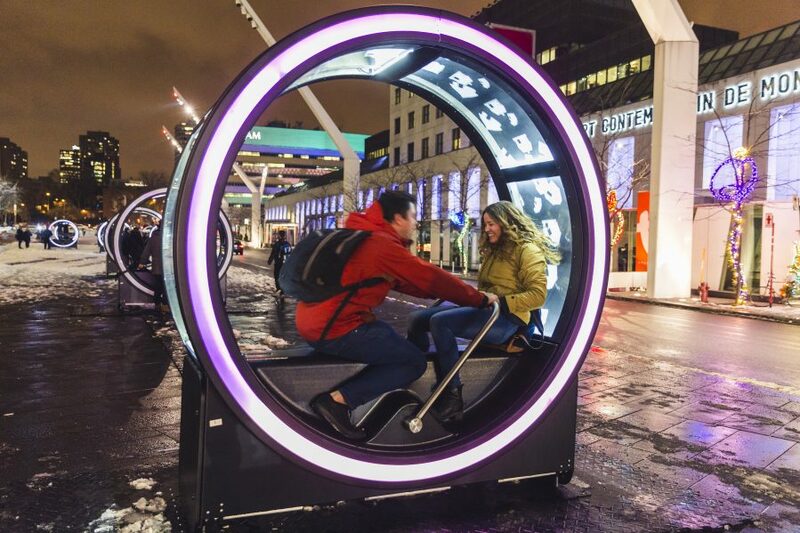 Loop is a cross between a music box, a zoetrope and a railway handcar – the pump-powered vehicles familiar from Bugs Bunny cartoons. The retro-futuristic machine plays 13 animated fairy-tale loops set in motion when visitors work the lever together. When the cylinder starts spinning, it lights up, making the series of still images appear to move. A flickering strobe effect accompanies the black and white images, like in the very first movies. The animation is visible from inside or outside the cylinder and can be viewed from up close or far away. The speed at which the images move, the frequency of the flickering and the tempo of the music are determined by how fast the participants move the lever. 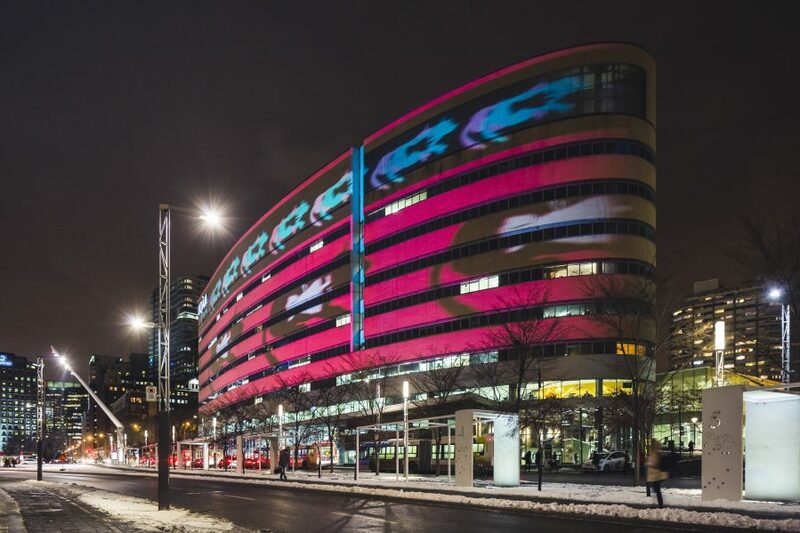 In addition, video projections by Ottoblix will be shown on two buildings overlooking the Place des Festivals: UQAM’s Pavillon Président-Kennedy and, for the first time, the side of the new Wilder Building Espace Danse. The projections feature characters and evocations of the mysterious settings of fairy tales, as well as a series of images representing the looping nature of zoetrope movies.